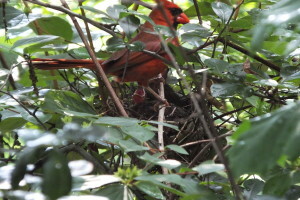 For about four years I’ve been tracking the cardinals of Prospect Park, cultivating a friendship with generations of them along a path in the Ravine–and all the time hoping and scheming to get to see the Elusive Cardinal Nest. This year and last I’ve found cardinal nests that failed elsewhere in the park. But this year I got to see one of the notoriously well-hidden cardinal nests up close. 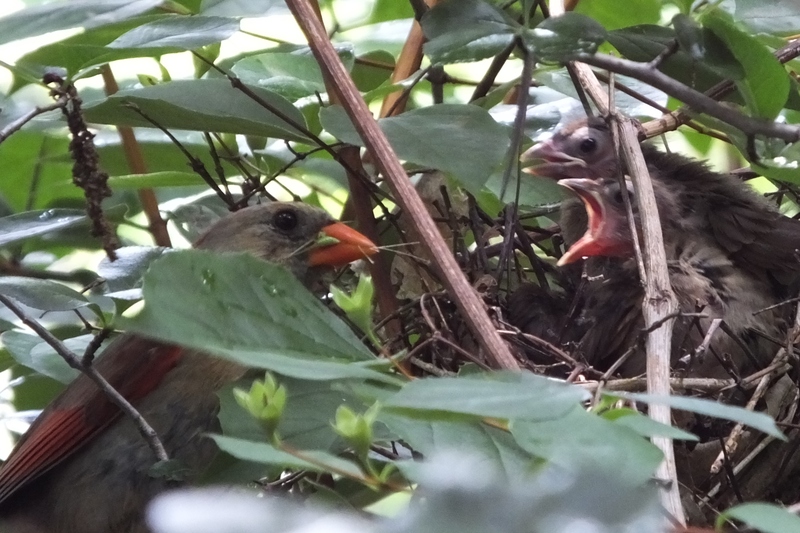 Luckily for me this cardinal pair–one of three along the path behind dog beach–built their nest in a thorny shrub easily seen from the path instead of the vast area of fenced off woods. This is the first year I didn’t see George–a cardinal we’ve known for years for his jutting white wing feathers and eagerness for sunflower seeds. I whistle. George comes and gets sunflower seeds. And eventually, George, George’s wife and several neighboring cardinals, whom I think are George’s sons. He would castigate them for invading his territory and they would submit to him. But this year, no bird with white wing feathers. I don’t know if they fell out or he died. But now there are several cardinals in the area who know the routine. Whoever the cardinals are that built this nest, they are part of George’s clan. I whistle, they come for sunflowers. Or, if I’m busy talking, they come and demand them by chirping loudly and jumping around. I saw one go to the nest, which is still pretty hidden despite being just five feet off the path. I’d see mommy cardinal on the nest. The dad would eat sunflowers and sometimes the mom would take a break and get some. I didn’t get to see the babies until this week when they were almost ready to fledge. There are at least three. The parents preferred to feed them freshly caught bugs while they ate the sunflowers themselves. One day the mom was missing for a long time and the dad kept calling for her. Finally she came back. I guess she needed a break. By then the babies were stretching their wings and getting ready. And then this Friday they were gone. Good luck, cardinals. A mother cardinal feeds her babies a juicy green bug.